Yorkshire has a proud history in sweet making and is renowned for it's world famous confectionery. Johnson's speciality toffees and fudges based in the heart of the county follow this tradition and have a reputation for creating delicious traditional flavoured recipes made from only the finest local ingredients. 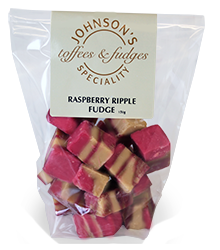 With over 70 years experience, expanding over four generations has made the name Johnson's synonymous with speciality toffee and fudge and one that has become a major wholesale supplier to hotels, food courts, shops, market stalls, retail establishments and specialist food shops with competitive prices and attractive margins.